Dr. Marjorie Zielke (middle) and her team of researchers, artists, and developers at the Center for Modeling and Simulation and Virtual Humans and Sythetic Societies Lab at UTD. Translating the proper use and settings of medical equipment into immersive gameplay that fulfills educational objectives presents multiple design challenges. This paper presents ten parameters for a model to create virtual medical equipment used in nursing education and other fields. Rationale behind virtual medical equipment simulation, as well as justification for the proposed model, based on lessons learned is included. The method for creating the model is explained by a two-part examination of the need for medical equipment simulation and the heuristics of the model itself. The model proposed is part of the design and research of an interactive course, NursingAP.com, a full online curriculum for graduate nursing students seeking a nurse practitioner degree in neonatal healthcare. The data collection methods for quantification of learning objectives through gameplay in the virtual ventilator are also discussed as a mechanism to improve design. Conclusions about the model and future enhancements for validation and investigation are detailed. The promise and challenge of virtual gaming technologies for chronic pain: the case of graded exposure for low back pain. High-fidelity virtual patients afford unlimited opportunity for practice in a virtual clinical setting and present multiple design challenges for developers of game-based simulations. Virtual patients allow students the opportunity to experience varied medical conditions as well as interact with patients with wide-ranging socio-economic and cultural factors. Practice with virtual patients also can improve both the accuracy and speed of cognitive, behavioral and psychomotor tasks. Virtual patients can be designed and adapted to simulate high-risk, low-incidence variations of medical conditions as well as altered to reflect regional, social, economic, behavioral and cultural factors. As opposed to simulations that use physical clinical settings and high-fidelity simulators, virtual-patient simulations provide ubiquitous, asynchronous learning and practice opportunities. Game-based simulations can provide instantaneous assessment and debriefing, both individually and in group settings. For these reasons, there is a growing interest in virtual patients for a broad range of applications, including academic, professional and military. Zielke, Marjorie A.; Roome, Thomas C.; Krueger, Alice B. Many benefits are available to people with disabilities who wish to participate in a virtual world. These include self-efficacy and the ability to share in virtual world community support. Further, many disabled residents of virtual worlds can vicariously experience physical activities through their avatar such as dancing, walking, and running – actions sometimes not possible in real life. However, learning the technology in a virtual world can be daunting for many new residents. Virtual Ability Island in Second Life® offers a platform for adults with disabilities to learn the functionality necessary to enter a virtual world. This article lays out a learning model based on the andragogy theory of Malcolm Knowles, often called the father of adult learning, and complemented by other recent research on eempowerment and virtual designs for those with disabilities. A composite construct is then created as a framework to study the development of Virtual Ability Island as a destination where new residents to Second Life® with disabilities can learn basic functionality and enjoy social and physical e-empowerment. Zielke, Marjorie, Ph.D.; Linehan, Thomas, Ph.D. This paper analyzes the design and development opportunities and challenges of creating a virtual cultural training simulation whose core features can be deployed across diverse media platforms such as personal computers, mobile devices, game platforms, the web, and Cave Automatic Virtual Environments (CAVE). This paper describes progress on a platform-flexible design approach for The First Person Cultural Trainer (FPCT), a high-fidelity simulation in which the user must build rapport with culturally rendered Afghan and Iraqi characters in order to unlock key information. FPCT was developed for Army Training and Doctrine Command Intelligence Support Activity (TRISA) at Fort Leavenworth. FPCT is part of the larger Hybrid Irregular Warfare Improvised Explosive Device Network-defeat Toolkit (HI2NT) program of federates and must operate within these architectures. In addition to design and development considerations, this paper explores the additional challenge of balancing the financial costs and performance benefits of developing for yet undetermined game engines and platforms. This paper offers suggested approaches to flexible design that can be applied to the future reuse of assets, training narratives, and core functionality in other simulations. Zielke, Marjorie A. Ph.D.; Linehan, Thomas E. Ph.D. This paper will describe the First Person Cultural Trainer (FPCT), sponsored by TRADOC G2 Intelligence Support Activity. FPCT is a 3D interactive simulation that trains soldiers on the values and norms of a specific culture in order to facilitate missions. The environment acts in a nonlinear way, as a Middle-Eastern geographic area would. The interactive simulation utilizes unique technology that gives soldiers the ability to read non-verbal communications of the non-player characters (NPCs) in the game. The project is currently focused on Iraq and Afghanistan, but has applications in many other cultural and geographic situations. FPCT includes four clearly defined stages which lead to the successful completion of missions. The project has adopted a challenge to develop extremely high-fidelity representations, using the living-world construct, to create an environment that serves as a training tool for cultural training before or during actual deployment. Supported by funding from US government sponsors, the Institute for Interactive Arts and Engineering (IIAE) at the University of Texas at Dallas (UT Dallas) has created a serious game that lets players increase their cultural expertise in simulated Afghan rural and urban environments. Toward that end, we developed the 3D Asymmetric Domain Analysis and Training (3D ADAT) model, a recursive platform for the development and visualization of dynamic sociocultural models. This model integrates visualization, sound design, and behavioral and cultural modeling with recursive assessment tools to create a living world that is sensory and culturally realistic. Figure 1 (next page) illustrates the rich detail and character development possible with the 3D ADAT model. 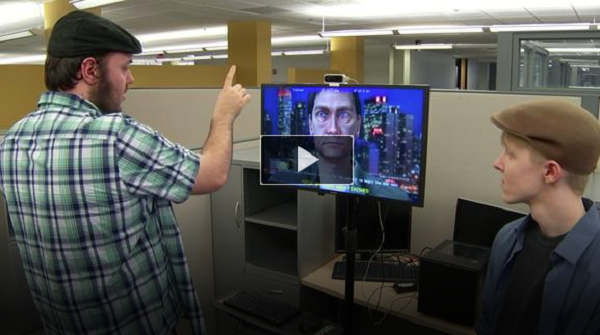 Understanding how to observe and analyze nonverbal communication of virtual humans in synthetic environments can assist warfighters with determining source credibility, deception detection, behavior observation, process training and other training objectives. The First Person Cultural Trainer (FPCT) is a high-fidelity, game-based simulation that trains cross-cultural decision making and is also a platform for the creation of synthetic characters which display culturally accurate facial and micro-expressions. These facial and micro-expressions serve as a channel for factors such as invariants and affordances within the synthetic environment that also communicate critical nonverbal information. This paper will discuss technical challenges and solutions in creating facial and micro-expressions and environmental invariants and affordances such as those needed in our high-fidelity training projects. The paper will also provide an overview of the state-of-the-art for creating nuanced nonverbal communications from the gaming industry. We conclude with a description of our solution to developing facial and micro-expressions and nuanced nonverbal communication that we feel best suits our needs at this time. Incorporating constructive models into a 3D game is an effective, realistic and nonlinear way to prepare warfighters for operational environment complexities. In its third development spiral, The Hybrid Irregular Warfare Network-defeat Toolkit federation, or HINT, sponsored by TRADOC G2 Intelligence Support Activity, combines an immersive 3D game-based simulation - The First Person Cultural Trainer (FPCT) - with the One Semi-Automated Force (OneSAF) and the Joint Non-kinetic Effects (JNEM) models in a hybrid model framework federation. This paper drills down on this methodology, focusing on benefits, challenges and lessons learned from integrating the OneSAF and JNEM models with the FPCT 3D game. In FPCT, the player discovers IED and insurgent networks through populace relationship building. The player wins by positively affecting the mood and cooperation level of the virtual population, thereby facilitating the collection of â€œgolden nuggetsâ€� of information. To create this gameplay, FPCT exchanges and incorporates OneSAF data, which simulates force-on-force activity, and JNEM data, which provides well-defined civilian influences such, as mood and cooperation of a heterogeneous population in an area of operation. The player then can positively affect the JNEM-driven mood and cooperation state through culturally correct populace interaction. If populace interaction is effective, critical information golden nuggets are collected during gameplay and published back to OneSAF and JNEM to model second-and third-order effects of ongoing military stability operations. Multiple data exchanges from OneSAF, JNEM and FPCT simulate dynamically changing operational conditions. The HINT methodology for combining constructive models with a 3D game provides a platform for lessons learned and also suggests other potential ways to develop simulations in this way. FPCT won the IITSEC Serious Games Competition government category in 2011, the Innovations in Department of Defense Gaming competition at the 2011 GameTech Conference, and the NTSA Cross-Function award in 2010. 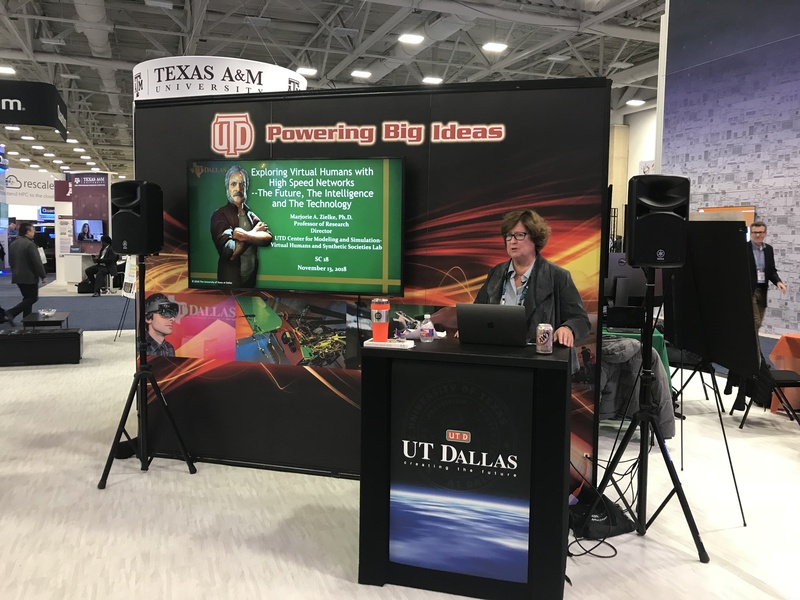 Dr. Zielke presents her research on virtual humans and US-Ignite high-speed networks at the Super Computing 2018 conference in Dallas, TX. 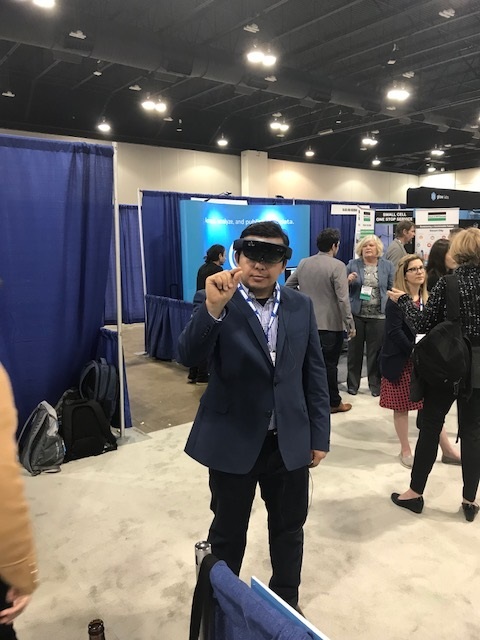 DJ Zakhidov positions Walter, a holographic Emotive Virtual Patient (EVP) in augmented reality, for demonstration of the EVP System App using the Microsoft HoloLens at the Smart Cities Connect Conference & Expo 2019 / US Ignite Application Summit in Denver, CO.
Dr. Zielke (middle), DJ Zakhidov (left), and Lenny Evans (right) pause for a photo at the Colorado Convention Center in Denver during the Smart Cities Connect Conference & Expo 2019 / US Ignite Application Summit. "INSITE," Interservice, Industry Training, Simulation and Education Conference (ITSEC), Principal Investigator. "Using a Game-based Simulation to Complement Face-to-Face Medical Education - Preliminary Research Findings." Zielke, M., et al. University of Texas System Innovations in Healthcare Education Conference. Austin, Texas. "The UT Time Portal." International Meeting of Simulation in Healthcare (IMSH), Principal Investigator. "GLIMPSE." International Meeting of Simulation in Healthcare (IMSH), SITE Principal Investigator. "GLIMPSE." Interservice, Industry Training, Simulation and Education Conference (IITSEC), SITE Principal Investigator. "NursingAP.com." 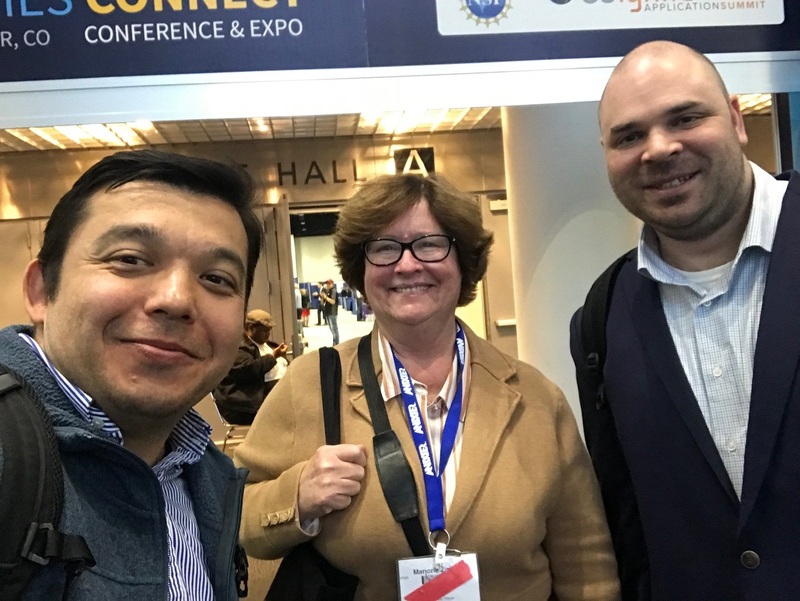 13th International Meeting on Simulation in Healthcare (IMSH 2013) Society for Simulation in Healthcare (IMSH), Site Principal Investigator, with Dr. Judy LeFlore. "NursingAP.com." Eighth Annual Innovations in Health Science Education Conference, Site Principal Investigator, with Dr. Judy LeFlore. "First Person Cultural Trainer." Interservice, Industry Training, Simulation and Education Conference (IITSEC), Principal Investigator. "First Person Cultural Trainer." Gametech. Principal Investigator. "Can Game Play Teach Student Nurses How to Save Lives -- An Undergraduate Training Proposal for Student Nurses in Pediatric Respiratory Diseases with a Living World Gaming Construct." 11th International Meeting on Simulation in Healthcare (IMSH 2011). Site Principal Investigator, with Dr. Judy LeFlore. "The First Person Cultural Trainer." National Training and Simulation Association (NTSA). Principal Investigator. "Pediatric Respiratory Distress." Society for Simulation in Healthcare (IMSH). Site Principal Investigator. "The First Person Cultural Trainer." Interservice, Industry Training, Simulation and Education Conference (IITSEC). Principal Investigator.